I hope and pray that this Christmas brings you warm blessings! Remember, Christmas is a celebration of the birth of our savior, Jesus Christ and is not just about presents and trees! That said, it is also a time for giving, which is far more rewarding than receiving! Try to find at least one person this year who is in need, whether you know them personally or not, and give them something to bring a little cheer into their life. Consider giving to a wounded veteran. Your local American Legion, Disabled American Veterans (DAV), AMVETS, or other similar organization is sure to know of many veterans in your area who could use a hand. America has a long tradition of celebrating Christmas. From the beginning, the importance of Christmas stood out for America. While fighting for our independence, George Washington went through one of the most blessed and the of the most trying Christmases in our nation’s history. Having suffered repetitive defeats for a year and a half against the most powerful army in the world, it was Christmas Day of 1776 when George Washington took his rag tag army of volunteers across the Delaware river in a surprise attack against the Hessians in Trenton, New Jersey. The German Hessians had been warned by spies, so Washington’s attack should have failed. The Germans were over confident and didn’t believe the attack would come, so they celebrated Christmas by getting drunk. George Washington caught them by surprise and in a very short battle, his 2400 men overwhelmed the 1500 Germans and took most of them prisoner. It was one of the most pivotal battles of the Revolutionary War and lead to a string of victories in the Revolutionary War. The following Christmas of 1777 wasn’t so blessed and marked some of the toughest hardships Washington and his armies ever had to endure. Washington’s army was out of food, supplies, and even clothing. My words can’t do justice to the misery the men suffered, so I will leave you with the words of George Washington himself, describing the conditions at Valley Forge. 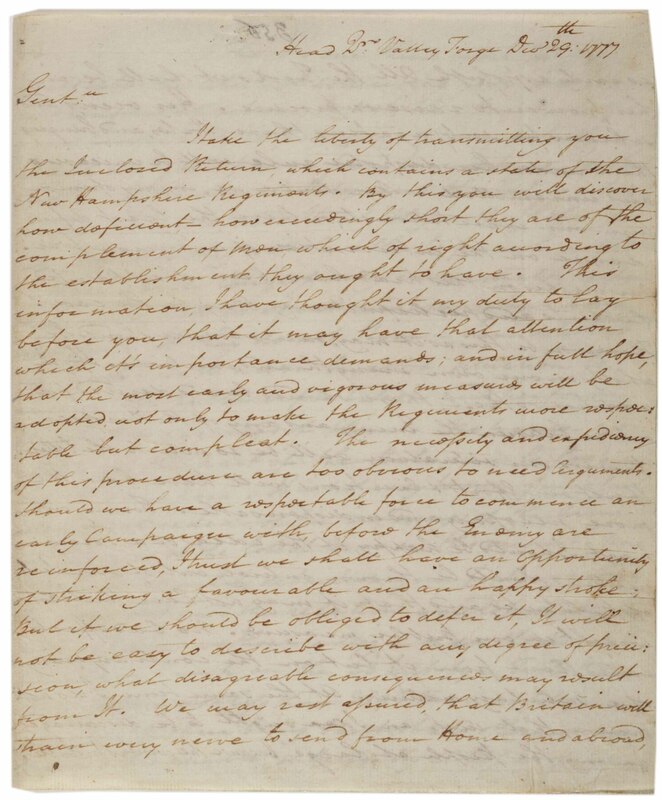 In a plea for help, he wrote this letter to the Convention of New Hampshire. The letter was also sent to the State Houses of every other state except Georgia. When you are celebrating with your family and friends this Christmas, exchanging gifts in front of a lit up Christmas tree, cozy in the warmth of a fireplace, remember what it took on Christmases past to bring you this luxury. Remember the honor, the bravery, and the pain and suffering it took to earn the freedom that we take for granted. Please take the time to read George Washington’s account of Christmas time at Valley Forge. Have and appreciate a very Merry Christmas! Valley Forge, [Pennsylvania], December 29, 1777. There is one thing more to which I would take the liberty of solliciting your most serious and constant attention; to wit, the cloathing of your Troops, and the procuring of every possible supply in your power from time to time for that end. If the several States exert themselves in future in this instance, and I think they will, I hope that the Supplies they will be able to furnish in aid of those, which Congress may immediately import themselves, will be equal and competent to every demand. If they do not, I fear, I am satisfied the Troops will never be in a situation to answer the public expectation and perform the duties required of them. No pains, no efforts on the part of the States can be too great for this purpose. It is not easy to give you a just and accurate idea of the sufferings of the Army at large – of the loss of men on this account. Were they to be minutely detailed, your feelings would be wounded, and the relation would probably be not received without a degree of doubt & discredit. We had in Camp, on the 23rd Inst. by a Field Return then taken, not less than 2898 men unfit for duty, by reason of their being barefoot and otherwise naked. Besides this number, sufficiently distressing of itself,  there are many Others detained in Hospitals and crowded in Farmers Houses for the same causes. In a most particular manner, I flatter myself the care and attention of the States will be directed to the supply of Shoes, Stockings and Blankets, as their expenditure from the common operations and accidents of War is far greater than of any other articles. In a word, the United and respective exertions of the States cannot be too great, too vigorous in this interesting work, and we shall never have a fair and just prospect for success till our Troops (Officers & Men) are better appointed and provided than they are or have been. We have taken post here for the Winter, as a place best calculated to cover the Country from the Ravages of the Enemy and are now busily employed in erecting Huts for the Troops. This circumstance renders it the more material that the Supplies should be greater and more immediate than if the men were in comfortable Quarters. Before I conclude, I would also add, that it will be essential to inoculate the Recruits or Levies, as fast as they are raised that their earliest services may be had. Should this be postponed, the work  the work will be to do most probably at an interesting and critical period, and when their aid may be very materially wanted. I have the Honor to be with great respect Gentln. Learn more from the Gilder Lehrman Institute of American History! Previous GOP Primary Poll! Post December Debate. MERRY CHRISTMAS ANNA GOD BLESS YOU AND YOUR FAMILY MAY YOU HAVE A HAPPY N HEALTHY NEW YEAR! !! Merry Christmas Everyone and God Bless! Merry Christmas. Thank you so much for all you do and the knowledge you pass on. You are a true Patriot. I hope you have a safe, happy and prosperous new year!